For the past 40 years, África Negra have been indisputably the most important and genuine ambassadors of the music of São Tomé and Príncipe, an island state in the Gulf of Guinea off the western equatorial coast of Central Africa. 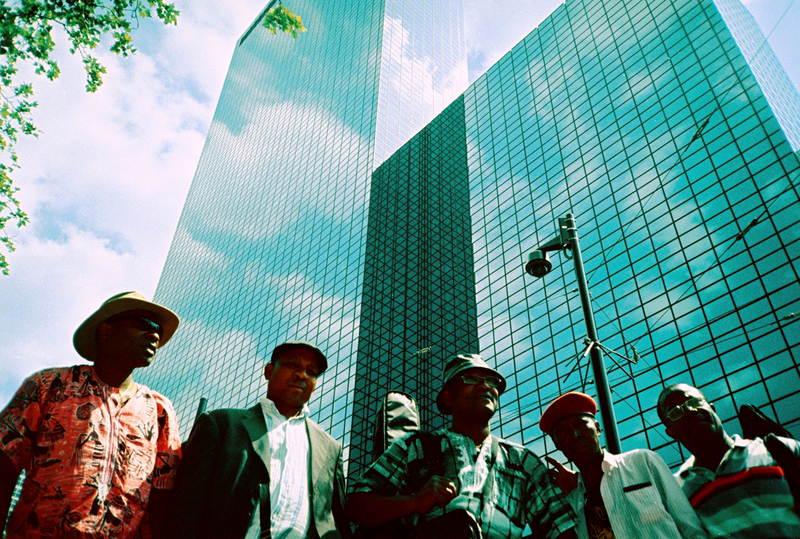 The band is extremely renowned in the lusophone African countries and its worldwide diaspora, be it Europe or North and South America, and are loved for their own inimitably style of heavenly mellowed São Tomé Rumba or Soukous, with blissful hints of Highlife, that their fans came to affectionately call as ‘Mama Djumba’. They originally got together in 1974 but their first recordings are from 1981, when they began successfully touring around Angola, Guinea-Bissau, Cape Verde and Portugal, while the music was being released on LPs on legendary Lisbon based label Iefe Discos, records now very sought after on the contemporary global vinyl collectors market lean on post-colonial electric african music. The band also published their music on cassette and CD formats on the ensuing years, and went through many line up changes throughout the 1990's, after the pinnacle ensemble of almost a dozen (included a brass section and dancers) came to an abrupt finale in 1989 in Cape Verde, due to a dramatic parting or split of the band in two, half of it returning to São Tomé and the other half staying in Cape Verde were their following was devilishly overwhelming. The group has stabilized their cast two years ago, which allowed them to play more regularly on their native country and increasing incursions abroad. They are still using some of their old instruments (miraculously they still work ), and vintage guitar effects processors that assure the original sounds from the recordings back in the 80s still shine trough their charismatic patine. They are a band of six (voice, two guitars, drums, bass and percussion), two of them are from the original formation: João Seria (voice) and Albertino (bass), but you also have to account for Leonildo Barros, the seminal guitar player that help make the band's sound, now living in Portugal, and finally reunited with their brothers of arms in the Summer of 2014 for a string of victorious shows in Euroland, including FMM Sines festival in Portugal and Berlin's Wassermusik Festival.